A question appeared this morning on the vC Ops VMware Community forum that I thought would be a helpful blog post. "Is it possible to monitor the services on the VM's?" 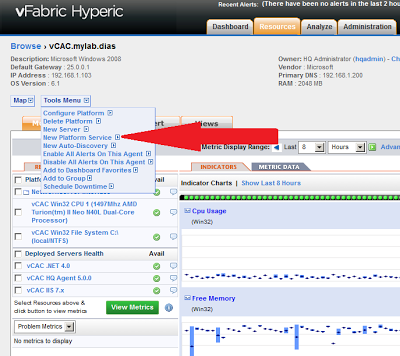 The answer is "yes" and this is done through the wonderful integration of Hyperic and vC Ops. Another response to this question is "yes, with vCM" and while that is true, it is a slightly different use case. I will explain quickly. - With Hyperic monitoring the service, you can not only get real time availability of the service (i.e. is it up or down?) 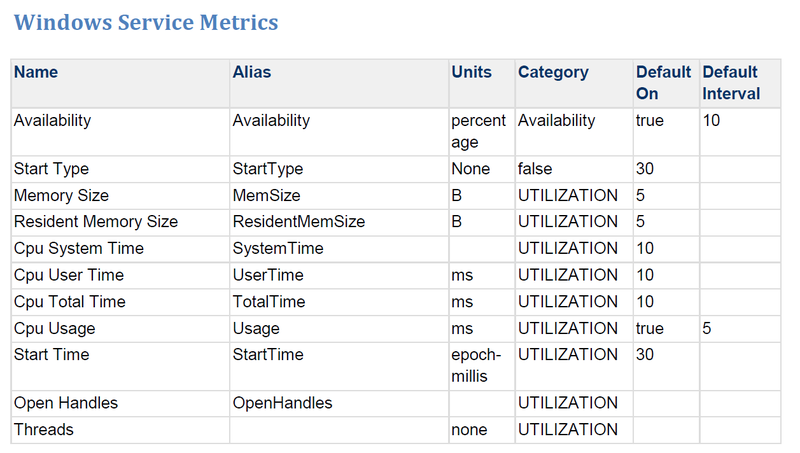 but also get monitoring on performance and apply the vC Ops analytics to those service metrics. 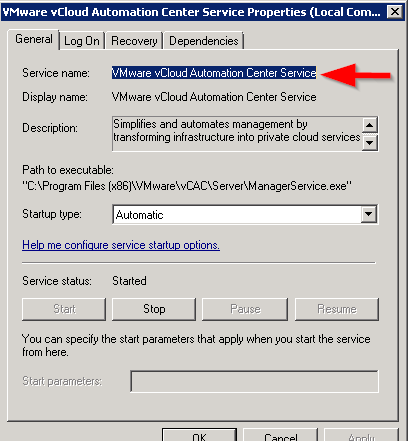 - With vCM you can validate if a service is in a particular state (running, not running, manual, automatic, disabled, etc) to enforce your server best practices, security and compliance. This is not a real time status of the service but rather a configuration check of the service at an interval you specify. I will assume the question is for the Hyperic use case and explain how to configure monitoring for a Windows service - I'll post the same for Linux, provided I get requests, but once you understand the Windows settings you should be able to figure the Linux side out for yourself. I also assume that you have Hyperic running, you have integrated it with vC Ops and that you have one or more Windows systems monitored by Hyperic. See my blog post "vC Ops and Hyperic - Dynamic Duo of Enterprise Management" if you need help getting started. First, from the platform browser of you Windows server, select Tools > New Platform Service as below. 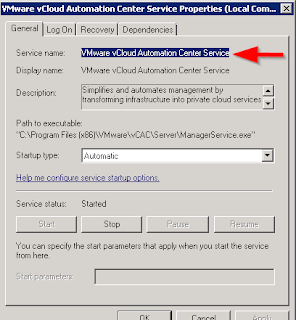 I am using my vCAC server running Windows 2008R2 in this example. In the New Service setup, define a name, description (optional) and select the Windows Service from the Service Type pull down menu. Note the other service types - I highly recommend you explore those as well. Click OK to continue. After clicking OK in the service setup above you will be presented with the properties page for the new service. 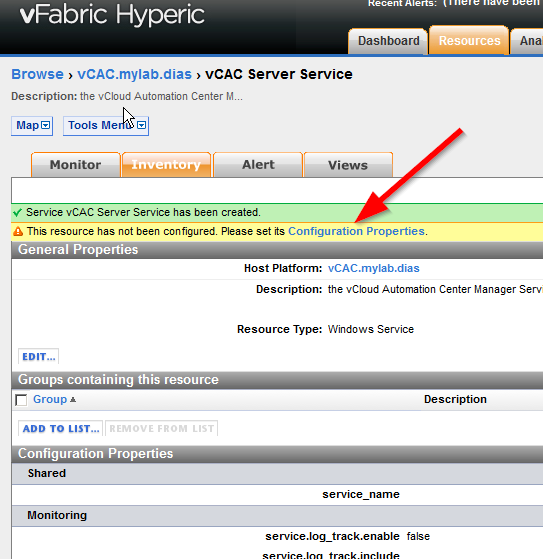 Click the "Configuration Properties" hyperlink. You will need the service name here. To get that, open the properties for the service on your Windows system and record the service name. 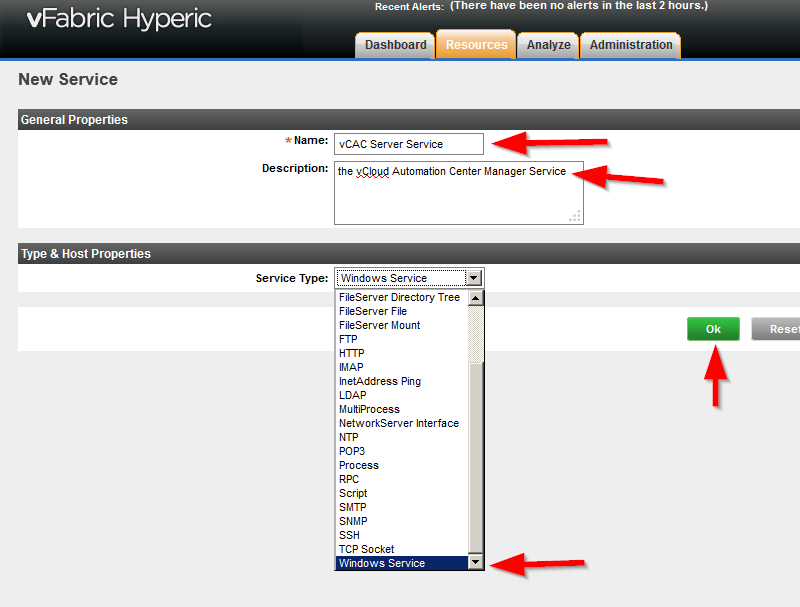 Then use that service name in the configuration properties and click OK. In about 5 minutes, you will have the metric data displayed for the default metrics as indicated in the screen cap below. If you expose all metrics by clicking "Show All Metrics" you can enable collection for the other metrics available. 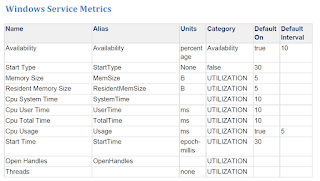 A full list is provided in the vFabric Hyperic Resource Configuration and Metrics Guide but I have included the table below for your reference. Now, if you have vC Ops configured with the Hyperic adapter, then those metrics will now appear in the Custom UI and can be added to your dashboards. Excellent post John.. Thank you so much to work on the question I posted on vmware Forum..
Could you please post for the Linux services??? I will work on the Linux side. Thanks! I want to monitor a vpxd (vCenter Server). After add to monitoring as Windows service, I see all metrics in Hyperic side and all metrics exclude "Avalibility" in vC Ops side. If you can help me to understand it ? 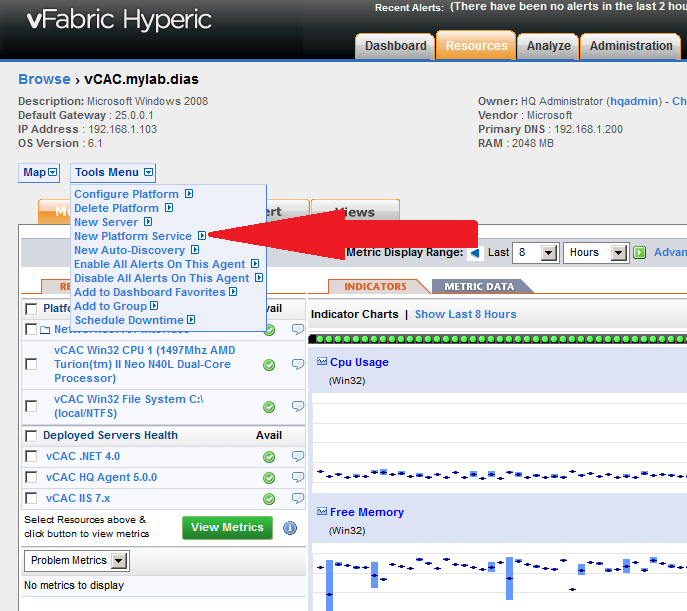 I just looked at my own 5.8 install which is running the new Hyperic Management Pack and I too notice that the availability metric is not coming over to vC Ops. I will look into this and post any information I find. In the meanwhile, you can still set up an alert for this from within Hyperic.